Officially a much bigger family! 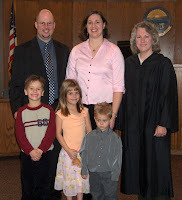 Our adoption was finalized today! Introducing Matt and Lizzie Lundy! :) Now Oct. 31st is even bigger at our house. Allen's birthday, Josh's adoption day, Halloween, and now Matt and Lizzie's adoption days too! It was a pretty comical hearing, mostly because of Matt being a silly 4 year old. Fortunately they're used to that and were really great. We had a lot of family and friends there and packed the room! Then we had a pool party and then another at the house with cake and ice cream and of course presents!